Locally Grown -The Freshest Fruits for Your Table! 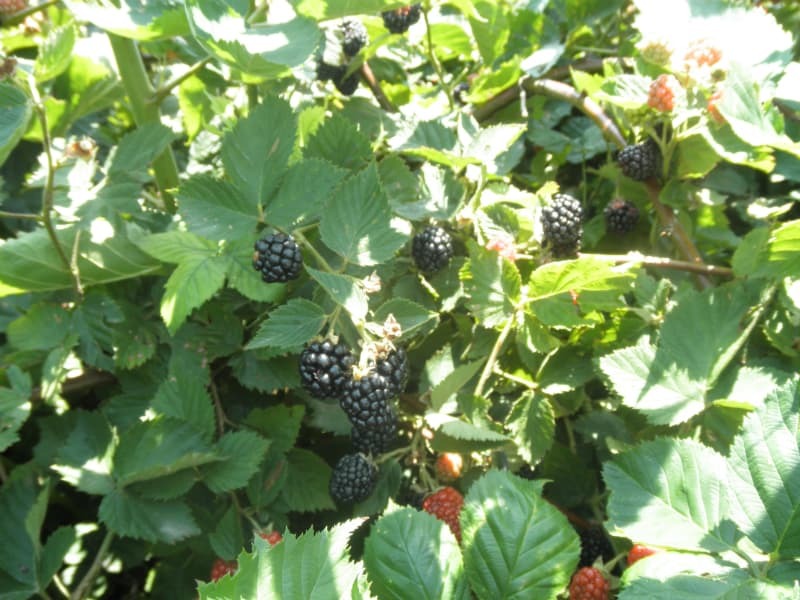 Grimm’s Gardens has many delicious wonderful home-grown fruits waiting for you when you come! 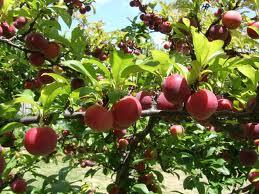 Enjoy the experience of summer in the country and pick your own delicious, healthy fruit for you and your family. Our season begins with the beautiful blooming shrubs and trees being pollinated by our own honeybees and bumblebees living on our farm. We sell honey from the honeybees in the sales shed! We have a variety of tasty fruits and nuts available, when in-season. We also, have a few listed below we are in the process of developing in the patch for future offerings. Be sure to check our home page for current availability! Apples “If an apple a day keeps the doctor away”, u-pick apples, straight from the farm should help keep the doctor away for a day or two longer! With the benefit of picking your own, the therapy of the summer breeze and the relaxation of being in the beauty of nature, all adding to your good health! 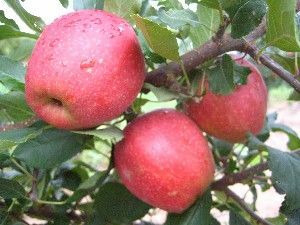 Our summer apple begins in July with the Pristine variety which is very similar to a Lodi, is good for applesauce, and is cedar-rust resistant. When the summer apples are gone we have a gap in picking for several weeks before we have Liberty Enterprise, Gold Rush and Jonafree. All of these apples are cedar-rust resistant apples. Some are great for applesauce; all are great for eating fresh, and Enterprise and Liberty store very well for a long period of time. 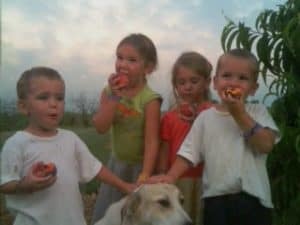 Our apple trees, as well as all of our u-pick fruit, is very close to our pond and picnic area which you are welcome to enjoy and use while picking fruit or shopping at Grimm’s Gardens. 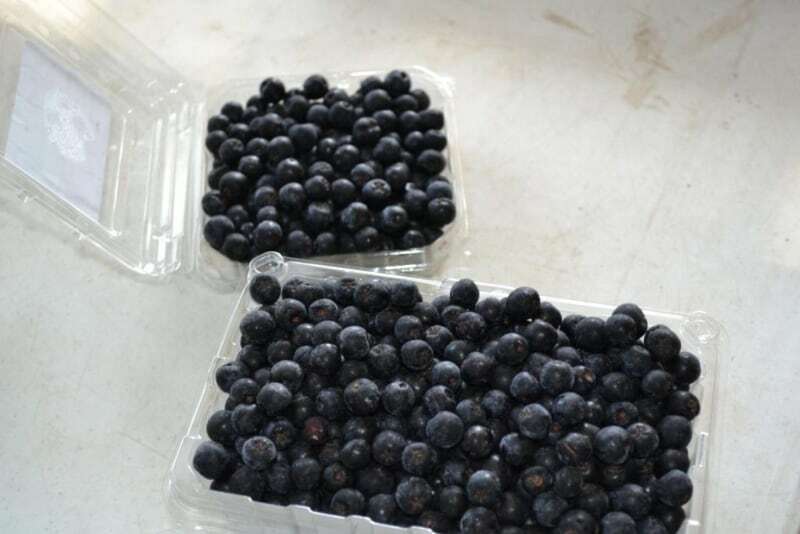 Blueberries have become one of the mainstays in our u-pick orchards, usually ripening throughout the month of July. 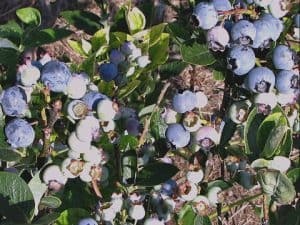 They are incredibly flavorful, easy to pick (no thorns on blueberry bushes), and yummy to use in so many ways. One of our favorite ways is to wash them, lay them out on an absorbent towel until dry, and then put in a zip lock bag and put in the freezer. They are ready to eat right from the freezer, just as they unthaw. Such a refreshing treat – all the flavor, the deep blue color contains all the health benefits that are so well documented in many health articles. 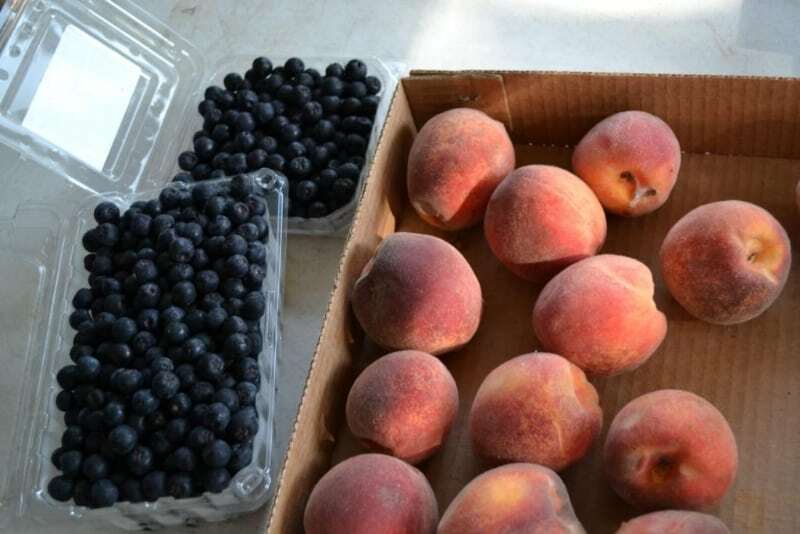 Peaches are the other mainstay, with blueberries, in our u-pick orchard. 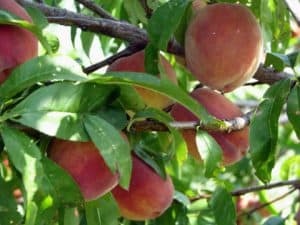 We have grown close to 20 different cultivars of peaches and over the years have gotten rid of the ones that were semi-cling or less flavorful. The peaches we offer in our orchard for u-pick mature over a wide span of time starting in July and ending in August. They are the juiciest, sweetest peaches, just like you remember from Grandma and Grandpa’s backyard trees. Elberta is one of the first to ripen as we have an early Elberta variety. Following the Elbertas we have some commercial varieties that are tagged “PF”, which stands for Paul Friday. Paul Friday was a man who developed many peach trees in Michigan. Glow Haven, Coral Star, Canadian Harmony, and Blushing Star, which is a white peach, are some of the varieties that pickers seem to think are the most flavorful. 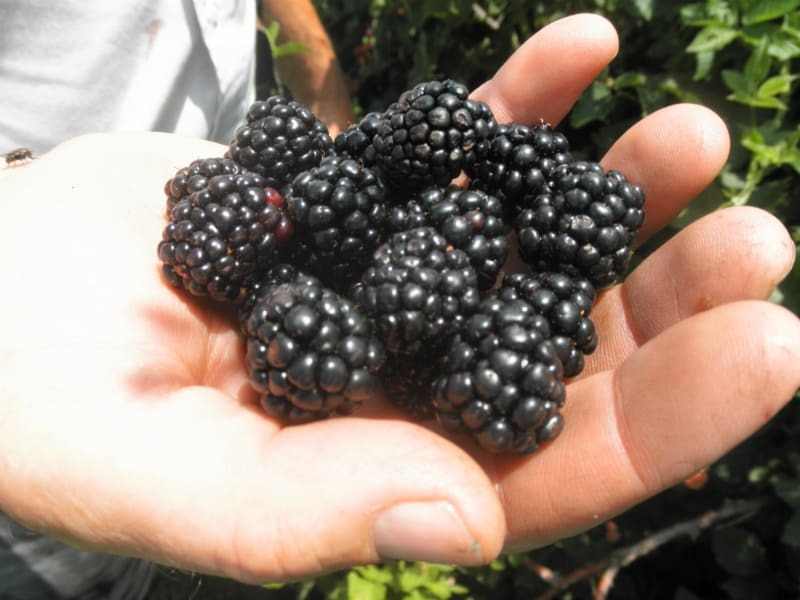 We have concluded that the variety that is the most flavorful is the one that is the ripest when you come to pick! We also offer most of these trees for sale in the nursery, so you can grow your own. The orchard is located on top of the hill, where we get very good air drainage (no frost pockets) has been producing peaches very consistently for us year after year. With our peaches, we do have had to resort to doing some minimal pesticide applications as we learned the bugs love them as much as we do! We have planted five chestnut trees that started bearing in 2010. We have been roasting our chestnuts, and oh my what a tasty delight. 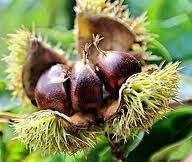 “Sooner than you think, but longer than you wish”, our trees will be large enough to share chestnuts with you. 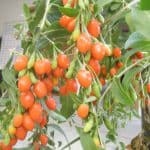 Goji Berries are known as a Super Fruit because of all the nutrients they provide. 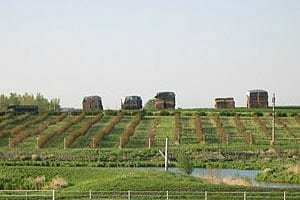 The plant originates from China but grows well in our Midwest climate. Try it raw, cooked, or dried! Aronias (a.k.a. chokeberries) were planted in the fall of 2010. 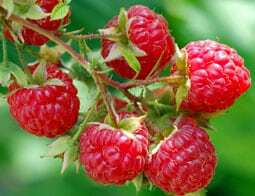 We are growing these as they make excellent jams and jellies, and some of the latest research indicates they are the #1 antioxidant. For the homeowner, plant one of the varieties that we offer in the nursery as an ornamental plant. 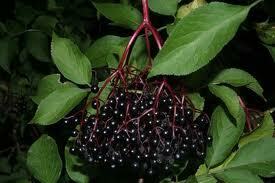 Black Autumn Magic puts on black fruit; Brilliant Red puts on red fruit, both bearing in the fall. 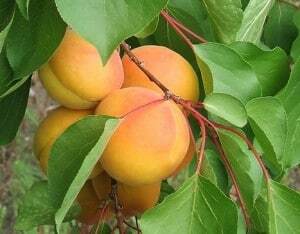 Apricots are beautiful flowering trees. They give us fruit only half the time, but when they do and are pollinated correctly, it is certainly worth that long-awaited expectation. They are the most inconsistent fruit we grow. They usually ripen sometime in June. 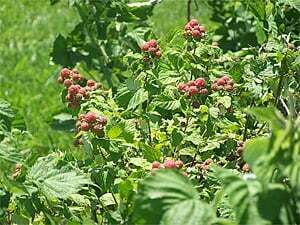 In the spring, red raspberries quickly begin to develop and are ready to pick in June. These are the spring raspberries which bear on last year’s canes. The same plants then send up new canes and will produce a fall crop in the same rows. The best variety we have found after many years of testing is called Nova. 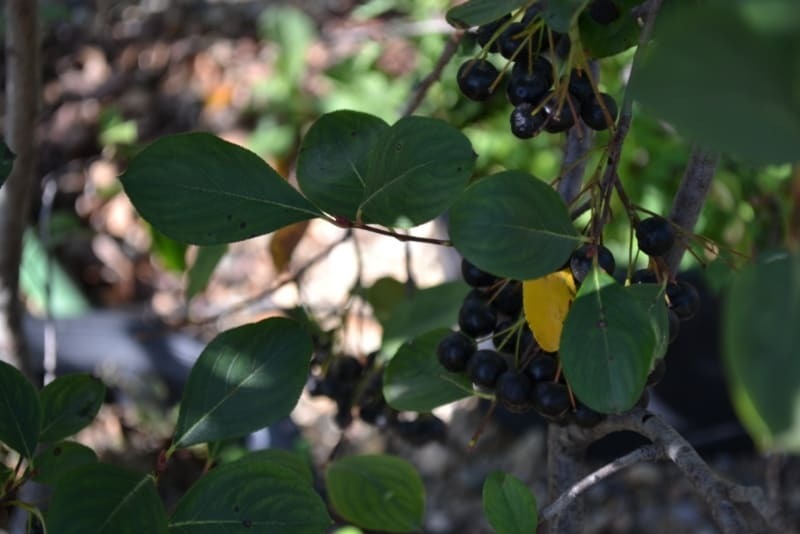 It has become our favorite for picking because it holds its fruit up above the plant away from the thorny stems and can easily be produced without being trellised. 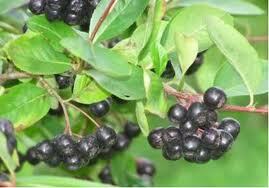 We sell this plant in the nursery, a big plus for homeowners who want to start their own berry patch. Sweet cherries had been planted and growing in the ground for a few years, but when the late spring freeze in 2008 came along, even on top of our hill, they died. We had to replant, so it will still be a few year before we have enough cherries to let you come and pick. 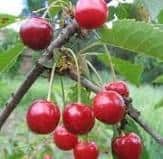 We will be planting sour cherries in the future. Juicy sweet pears! Our pear trees were planted just two years ago, so we expect to exercise our patience as the trees get larger for at least three to four more years. We pick small fruit off so it can put its energy into becoming a larger tree sooner for you to come pick from. We will keep you posted. Plum trees started to bear in 2010. We only have ten of these trees, and as they become larger, we hope to be able to offer some fruit for the u-pick operation. Persimmons produced for the first time in 2011 after growing for over a half decade, and they were worth the wait. 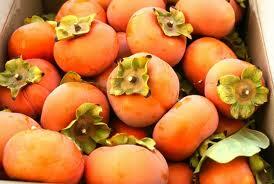 A ripe persimmon tastes like a Snickers candy bar according to Doug. Jeryl says if it’s not ripe, it’s the most awful thing you ever ate! We are planting more persimmons! 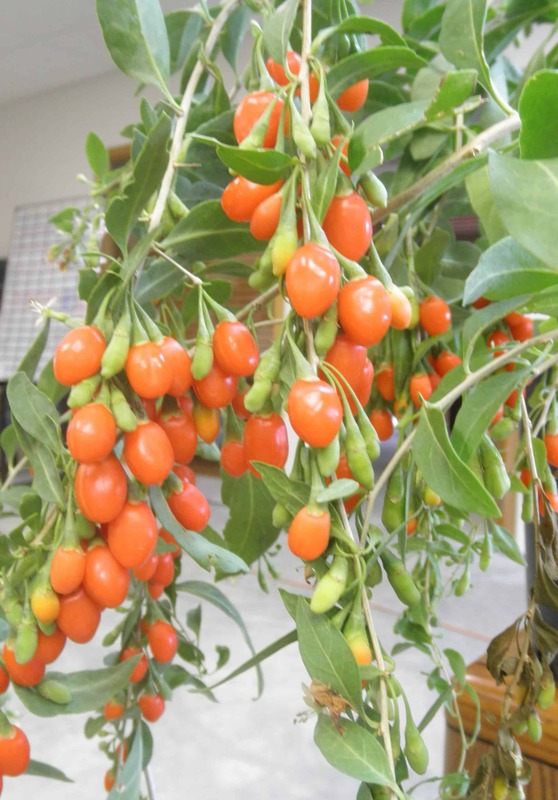 Persimmons are either male or female when grown from seed, and it may take many years before you will give up and decide your tree is only a male. But, by then you will have a nice shade tree, and oh well…”Life is a shade better under a tree”. So buy a grafted tree and you will get the fruit as you sit under your nice shade tree. We grew cuttings from elderberries selected by experts who have been watching this plant develop in search of excellent fruit quality and production. This is another plant we hope to have a few rows of in the future for you to pick. As of now, we are picking ours in the wild and looking forward to the day when it will be easier – the benefit of a u-pick patch!